But here I am on an open-air bus, bumping along a dirt road on a steamy isle off the southeastern coast of Africa, quite possibly on the way to being mauled by predators. 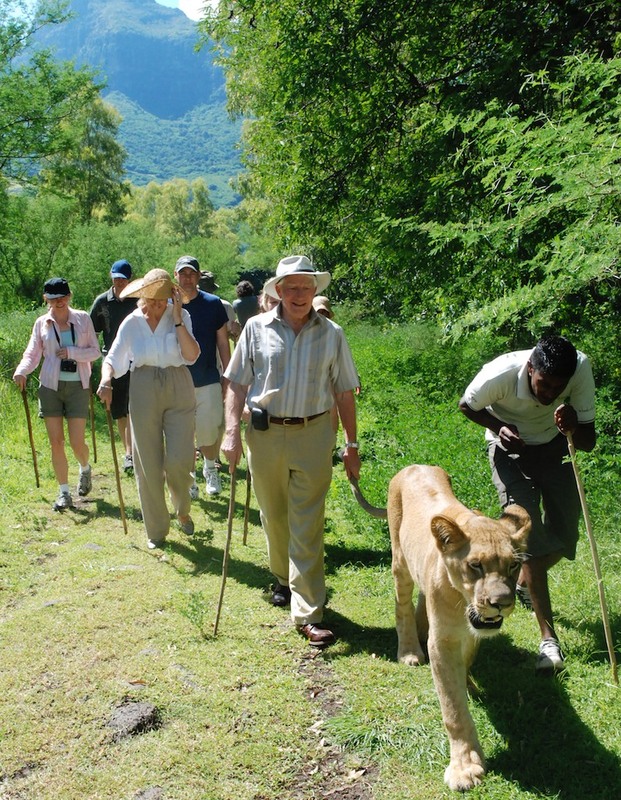 The Lion Walk at Casela Nature & Leisure Park seemed like such a good idea as I sat at my computer researching this Indian Ocean destination. 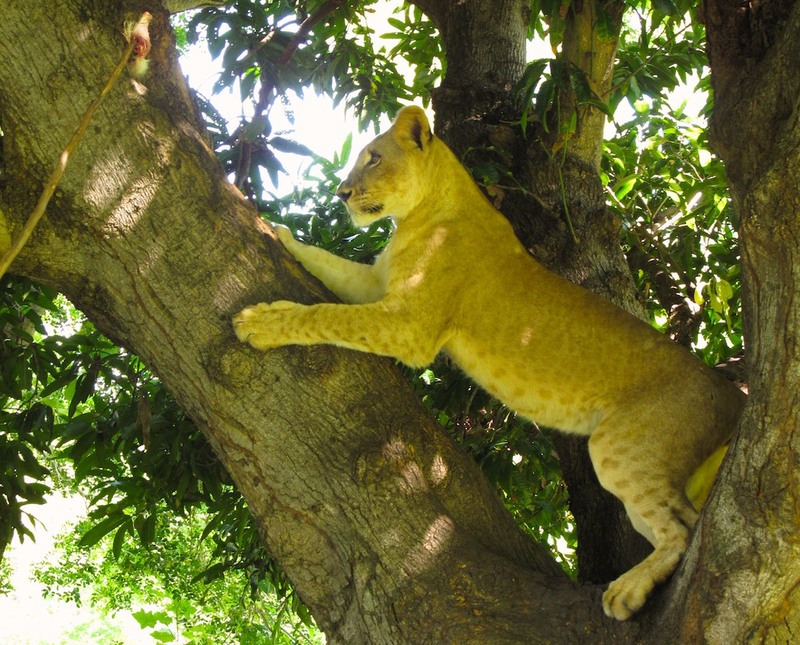 The park, home to giant tortoises, tigers, monkeys, zebras and 150 bird species (including the pink pigeon, a relative of Mauritius’ famously extinct dodo), was a clear favourite on TripAdvisor. Reviewer after reviewer dubbed the hour-long Lion Walk “the highlight of our trip”–including one honeymooner, before hastily adding, “Well, other than our wedding day, of course!” Nice save, buddy. As our vehicle grinds to a halt on this sultry Maritian morning, I get my first glimpse of lions, lazing behind a chain link fence in a large, shady enclosure. 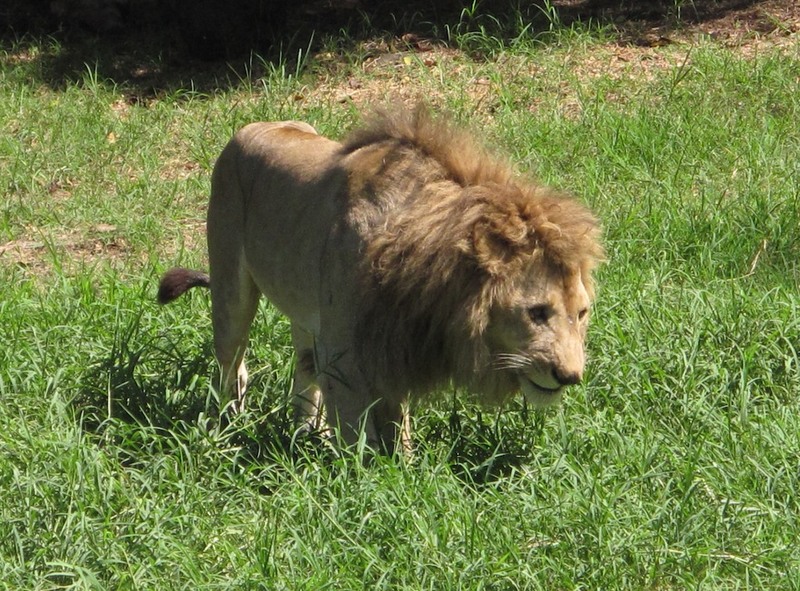 Whatever you do, do not tease the lions about having a bad hair day. The beasts, including a massive male with a mane that Tina Turner might envy, are bigger than I expected. Much bigger, I note, silently cursing TripAdvisor, Al Gore (who famously claimed that he “took the initiative in creating the internet”), and whoever first rubbed two cats together and discovered electricity, the root of all technological evils. A lion handler bonds with a lioness. Please kids, do not try this at home. My fears are not abated when employee Ajay Narsimeoloo hands each of my companions and me a waist-high stick. What? No rifles? No stun guns? Just a lousy stick? “Wait, why does mine have bite marks in it?” I quip, a nervous attempt at humour. “Mine’s bitten off at the end,” jokes Beverley Daniels, a jovial British blonde. Narsimeoloo doesn’t reply, but he fastens his dark eyes on a young brother and sister in our group and leads them off to be measured, as the rules require you to be at least 1.5 meters tall to participate. Why? 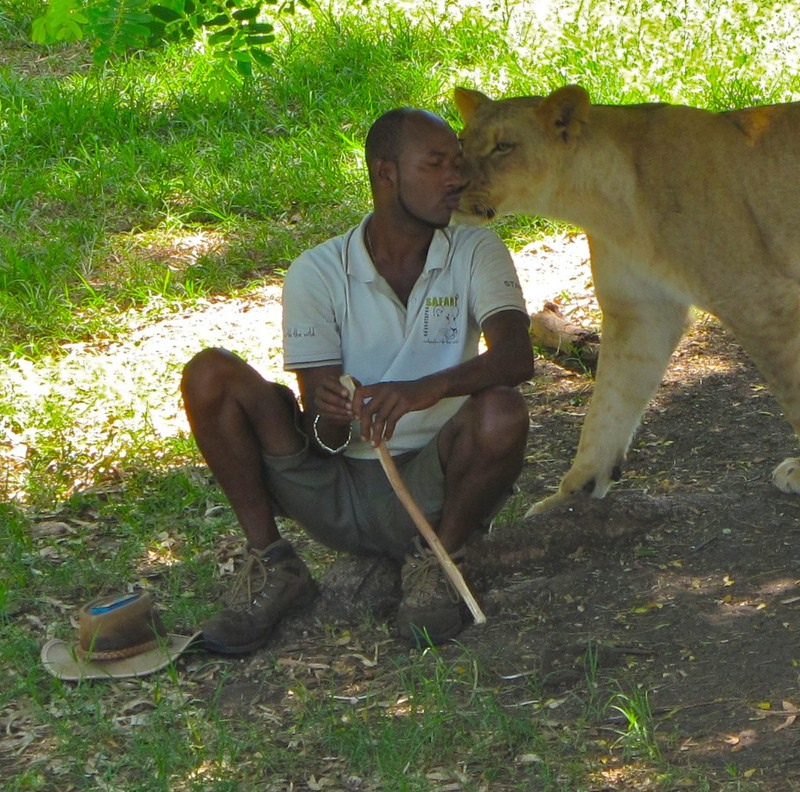 “Because if the lions see you are smaller than them, they think you are something to eat,” Narsimeoloo explains. Alrighty, then! 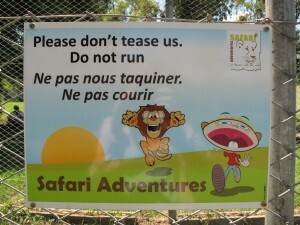 Don’t run. Stand still while we eat you. We enter another gated enclosure and shuffle along a dirt trail through long grass and tropical foliage. When we reach a clearing, two lions materialize along the path, accompanied by a photographer, a man with a movie camera, and another handler with a very long stick, which I can’t help but envy. Lundi (16 months) and Nhunzi (14 months) are both females about the size of a pair of German Shepherds. Minus a masculine ruff, they’re less intimidating than the males–until you realise that females are typically the hunters. But they cavort with one another like kittens, and it dawns on me that I might just survive. 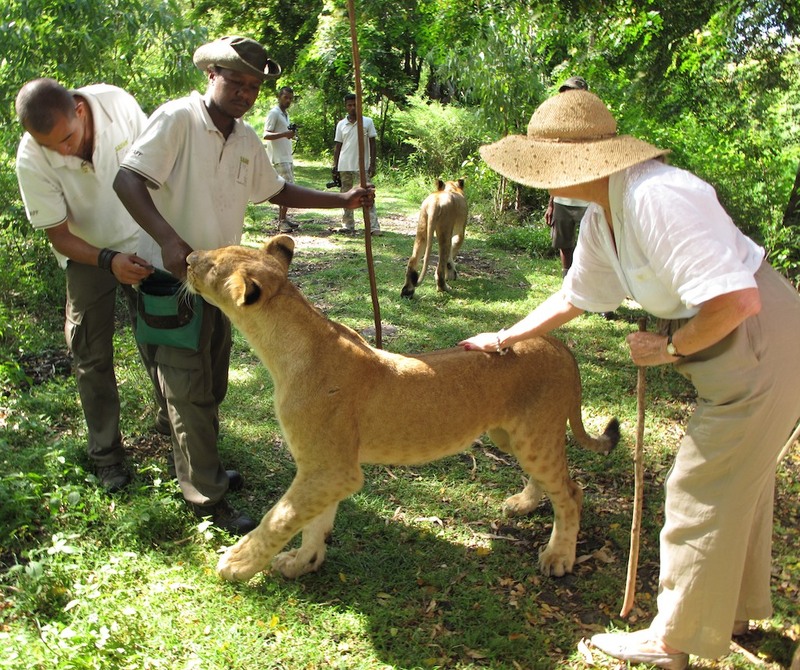 With the lions and handlers leading the way, our little parade proceeds through the sun-dappled forest. We’re not far along when the handlers encourage folks to step up and pet the cats. A woman demonstrates a classic pickpocket technique. Get a lion to gnaw on your mark’s fingers while an accomplice steals his wallet. One even encourages me to gently tug on Lundi’s tail. She is completely nonplussed, and I relish the feel of her bristly fur. 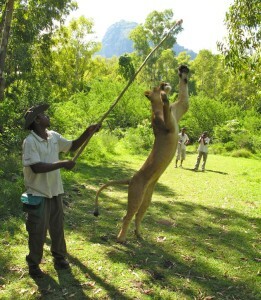 As a couple of cat-herders beat the bush in search of Nhunzi, who eventually rambles out licking her chops, another demonstrates how Lundi will leap into the air to grab meat off the end of the pole. Then he lures her up a tree, distracting her with a chunk of chicken on his stick, so that we can pose for a picture beneath her. 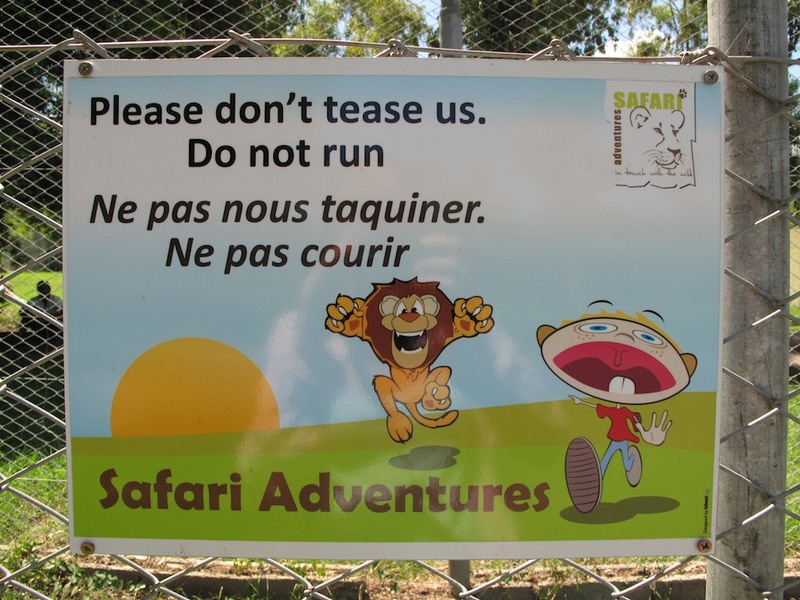 This seems foolhardy in the extreme—turning your back on a lion with someone dangling meat over your head—although it doesn’t stop us from doing it. Someone call the fire department. There’s a kitten stuck in a tree. The only thing sillier would be to simultaneously break nearly every rule we were given—crouching beside Lundi and petting her on the head. But that’s exactly what the trainers suggest we do next, with a pole positioned between our bodies and the lion’s jaws, so that this moment, too, may be captured on camera. I approach timidly on Lundi’s left side. As I cautiously scratch behind her ears, she doesn’t quite purr, but she blinks contentedly and yawns–which appears gratifyingly like a fierce roar in the photos. Me and Lundi. Nice kitty. I’ll take dozens of snapshots of blue-green water, creamy sand beaches and lush valleys throughout my holiday on Mauritius. But the image of Lundi and me is the one I’ll treasure most. It’s going to look great on my Christmas cards this year. Casela Nature & Leisure Park: www.caselayemen.mu.